“Love is the greatest refresh­ment in life,” according to Pablo Picasso. With all due respect, I’m will­ing to bet some would argue that chocolate and wine are right up there as well. That pleasurable feeling we get from love may be a result of something called phenylethy­lamine coursing through our veins. It turns out that chocolate contains the sensory-stimulating substance along with the energy boost that caffeine provides. The alluring power of choco­late dates back to the Aztecs and the Mayans who are said to have thrown wild parties to celebrate the cocoa bean harvests. Aztec ruler Montezuma so loved chocolate, he reportedly sipped numerous cups of it every day. Often deemed “The World’s Greatest Lover,” Giacomo Casanova enjoyed his chocolate almost as much as his women, linking it to lidibo-lifting quali­ties. What Montezuma and Casanova didn’t know back then was that consuming chocolate, specifically dark chocolate, in moderation, can lower high cho­lesterol and fight heart disease. Studies have shown that drinking red wine, also in mod­eration, can provide health bene­fits. The alcohol and the antioxi­dants in red wine work to increase levels of good choles­terol and protect the arteries from damage. These recent studies seem only to reiterate what people have known or suspected about wine for thousands of years — that “no thing more excellent nor more valuable than wine was ever granted mankind by God,” according to Plato. “Wine is the most healthful and the hygienic of beverages,” Louis Pasteur’s believed. Pairing chocolate and wine for Valentine’s Day seems like a match made in heaven. Here, a robust Malbec is reduced and added to dark chocolate, produc­ing a palate-pleasing and well­balanced yet intensely flavored Melt-in-Your Mouth Malbec Truffle, the perfect ending to a romantic Valentine’s Day. Share the romantic power of wine and chocolate with some­one you love this Valentine’s Day, especially because doing so is easy. If you can boil water (wine in this case) and stir (well, whisk), you are on your way. Pour entire bottle of Malbec into large heavy saucepan, place on medium high heat and reduce to ¼ cup. In a separate medium heavy saucepan, heat cream to a sim­mer (low gentle boil with small bubbles). Remove cream from heat and add chocolate, whisking until smooth. Transfer to a covered contain­er and refrigerate overnight. To assemble truffles: Remove 1 tbsp. truffle mixture from cov­ered container at a time and roll into small balls, rolling each truf­fle in cocoa powder to prevent sticking. 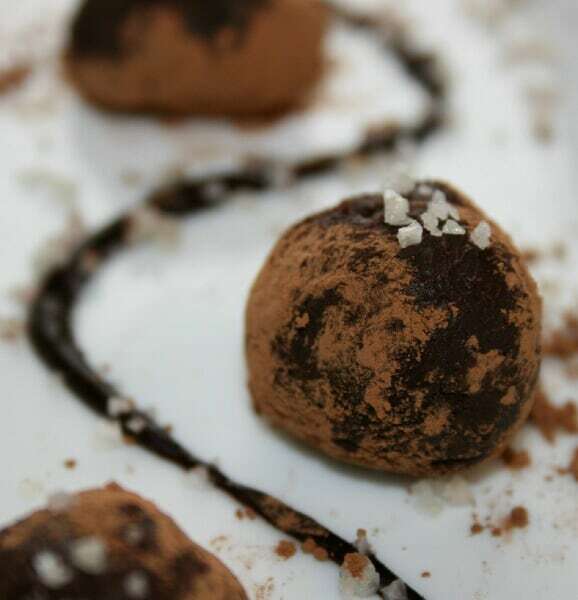 Sprinkle a few grains of smoked sea salt on top of each truffle. Refrigerate until ready to serve. Makes 18. Note: Extra truffle mixture can be heated briefly in the microwave to melt and be used as a sauce to garnish serving plates.